Anusha and Raju have not got a wink of sleep from the past two weeks. 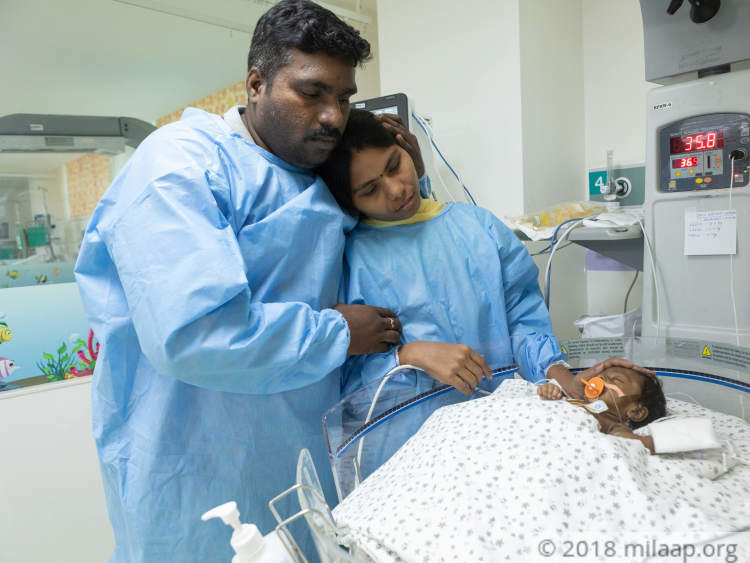 Their days and nights are spent outside the ICU in which their baby boy is fighting for his life after his intestinal lining was eroded due to cow’s milk intolerance. These desperate parents have given up eating properly too, and it shows clearly on their tired faces. All they want is their kid to be alright – they are even ready to give their own lives for him at this point because they have exhausted every paisa they had. “We were so glad that God had blessed us with a healthy child. 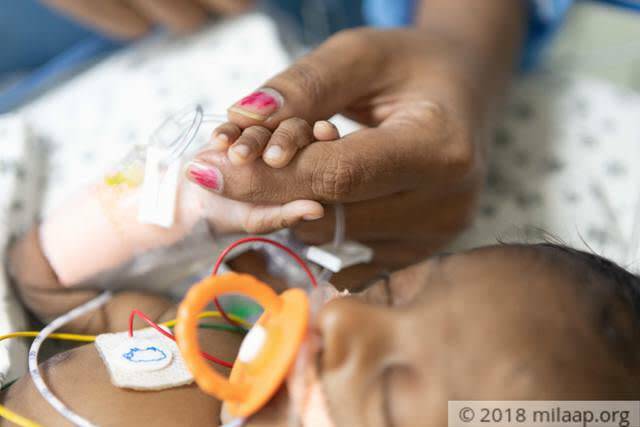 We had to feed him formula milk because I could not produce breastmilk; we didn’t realise that our baby would land in a critical state in the ICU because of it.”-Anusha, mother. 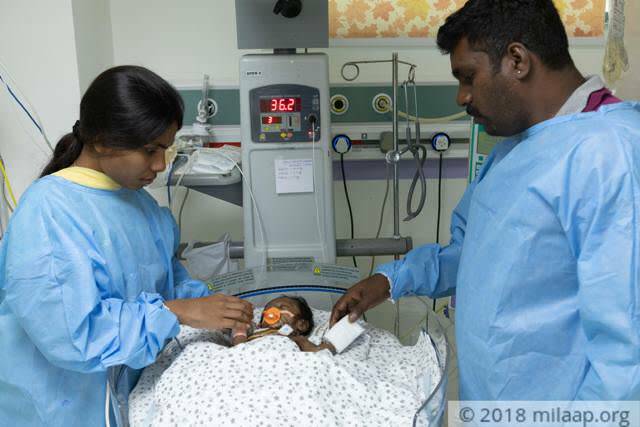 Anusha gave birth via C-section to a baby boy weighing 3 kg on May 2. It was the happiest day of her life, despite losing a lot of blood. 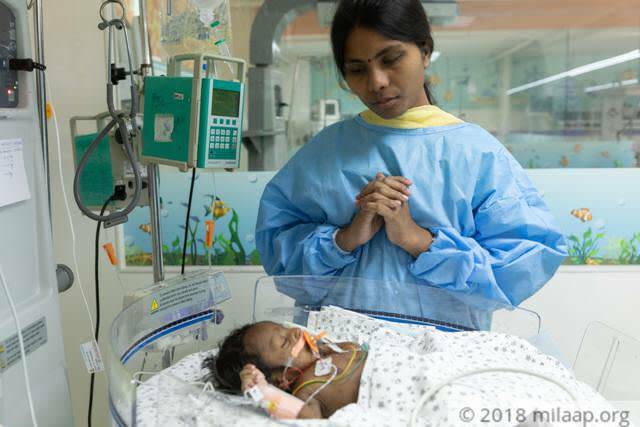 She had to spend 2 weeks in the hospital and was so weak that her body was not able to produce enough milk for the baby. He was given formula milk. “All was well until we started noticing that he was losing a lot of weight. He had become very dull as well. We didn’t know what was wrong then.”-Raju, father. The doctor prescribed new formula milk for the baby. Raju and Anusha believed that this would make him alright, but on the contrary, he started getting sicker. “He started vomiting continuously. Then came the loose motions – can you imagine such a small baby going through such horrors? He was constantly dehydrated because of the loose motions. He didn’t even have the energy to cry, my poor baby.”-Anusha. “He was admitted in the Warangal hospital for around 3 days. No medicines helped…he was slipping away from us. The doctors couldn’t understand what was wrong with the baby. His loose motions and vomiting had become more vigorous.”-Raju. 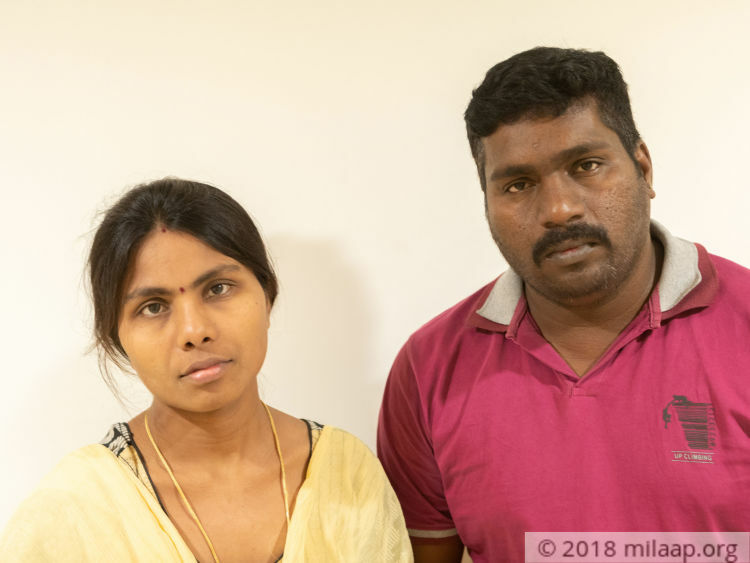 Anusha and Raju left their first child, 3-year-old Ashrita with a close relative before taking their child to Hyderabad. They knew that their child was in a critical state and needed treatment in a very good hospital, and were willing to go to any extent. Doctors suspected that a sudden change of formula may have irritated the baby’s sensitive intestinal lining. The baby was rushed to the ICU immediately. He would have lost his life if these parents had been just a minute late in taking him there. “He has spent the last 15 days in ICU – all covered in tubes and equipment. He needs close monitoring or he will not survive. The doctors have told us that he will get better with time, but we cannot afford his ICU costs anymore.”-Raju. 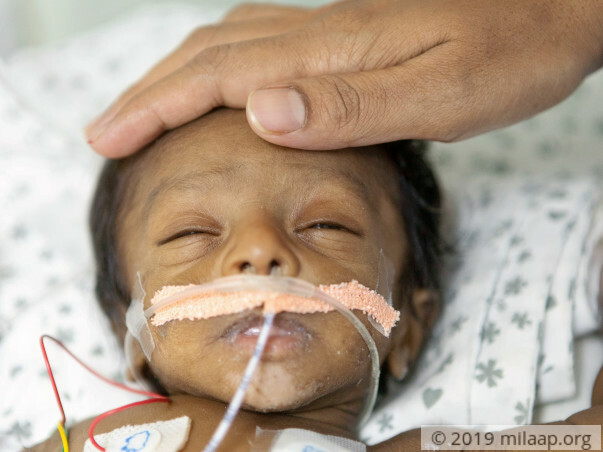 Raju and Anusha's 1-month-old baby needs at least 10 more days in the ICU to get better. He cannot survive without constant monitoring of his health. Raju is a small contract worker for the Railways and earns only a meager amount. 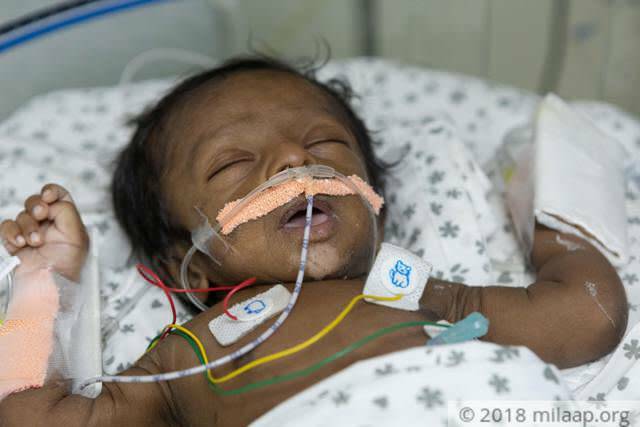 He needs our help to save his newborn. Thank you so much for the support you have shown so far. Anusha's baby is doing well and has been discharged. 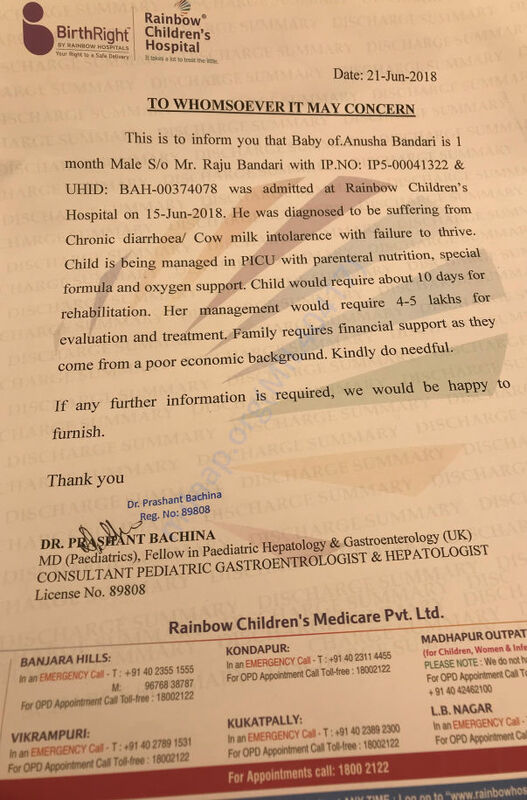 the child is requiring special formula ; each milk Tin costs 3000/ rs .It would approximately cost about 30,000 rs / month to pay for the baby's treatment. The baby will still visit for regular check ups.